The only thing that’s missing here is snow! And topped with stars that always bring a smile…! With chocolates, nuts + candy canes galore! And be the best that you can really be! It only takes a minute or two to show people you care. It’s as easy as donating a looney or two, helping a neighbour hang lights, sharing cookies with co-workers or taking a friend for coffee! And remember, if you are strapped for time, you can always visit your nearest Take Five Cafe for a bundle of cookies or a cup of holiday cheer! Whether you’re walking back to your office, strolling in the crisp outdoors or taking a treat for a friend, our favourite seasonal drinks are dressed + ready to go!….just in time for the holidays. Choose from the classic taste of Egg Nog, old fashioned Candy Cane, or the flavour of timeless gingerbread –all created with our perfectly balanced espresso + creamy steamed milk. And what makes these holiday beverages even better?…they truly are all dressed up and ready to go!…in a Santa Suit, of course! Visit us today to get in the holiday spirit! Have a safe and happy holiday season from the Take Five Café Team. Is the joy of the season mixed with fear of the “lists”. The Christmas tree stands waiting for décor. The stockings aren’t hung cause the hooks are not right! And the egg nog is sour cause it wasn’t kept cold. Although you are scrambling there’s less time than you thought! When what to your wondering ears should you hear? Take Five’s solution to the lists of the year! Don’t rush + don’t panic just don’t make it hard. Glowing candles for the mantle is perfect – you’ll see! As we make your list simple you’ll note, that’s not all! Take Five has the cookies for sale – you’ll be thrilled! And the egg nogs in lattes – which are hot + not chilled. And the best tip of all if gift buying is hard? Come visit Take Five for a simple Gift Card! Merry Christmas to all! Your list is done for the season! Buckle up + get ready as it’s the magical time of year where even the coffee cups are dressed in holiday style! It’s also the perfect time of year to treat yourself to a holiday inspired beverage. Choose from the classic taste of Egg Nog, old fashioned Candy Cane, or the flavour of timeless gingerbread – all created with our perfectly balanced espresso + creamy steamed milk. 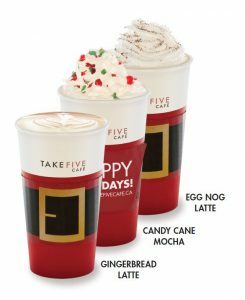 Stop by Take Five Café + get into the holiday spirit! Eggstra Company over the Easter Holiday? It’s been written in books + shown on the screen, the tale of the Grinch, + how he’s so mean…. A miserable sort who does his right best, to take joy + love from all of the rest. How he takes from the Who’s to ruin their day, only to find Christmas comes anyway. We all have that person, the Grinch in our mist, who seems to display all black marks on the list. Perhaps, as the story, there’s more to their tale, perhaps there’s a soft side that needs to unveil. This message is simple – beat the Grinch with a smile, spend time if you can – go the extra mile. A box of your cookies, an invite for tea – show them they matter, give kindness for free. No need to avoid them, keep them in sight, give them attention – perhaps an invite! We understand that holiday shopping can be tiresome. Pajamas for Grandma; a new camera for Dad; a teddy bear for baby and light up antlers for the puppy. 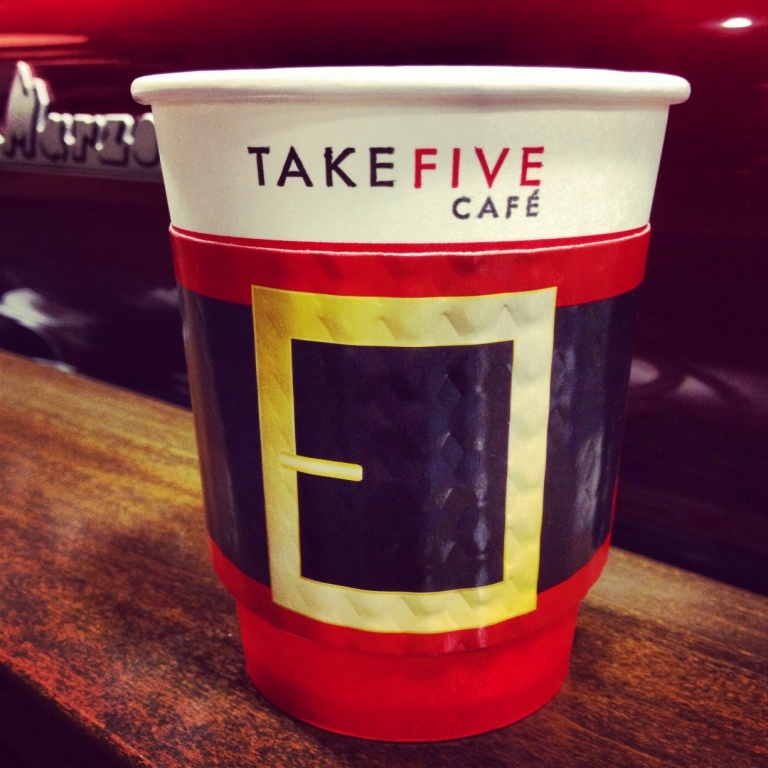 Whatever your holiday wish list looks like, one thing won’t be hard to find: your Take Five Café coffee. We’ve got you covered when you crave an egg nog latte or need a peppermint chocolate pick me up. Check out our holiday hours for all store locations below. Whether it’s back to your office, a stroll in the crisp outdoors or a treat for a friend, our favourite seasonal drinks are dressed + ready to go!….just in time for the holidays. Halloween was recognized just for the day. children in costumes calling out “boo”. back in the day, Halloween wasn’t this loud. Webs + witches all propped in a row. batteries make the odd prop to rise. scary heads propped on tables – much gore! what’s missing from all this Halloween display? What don’t you see so much anymore? A pumpkin all lit, by the front door! a chance where fun + creativity meet. If you can’t beat them, join them, is what they all say. So we have, and made our own treat to display. 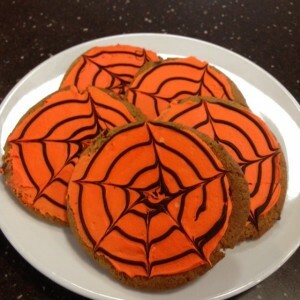 Visit + buy some Halloween fun, next time you are on your coffee run. it is our take on a seasonal treat.